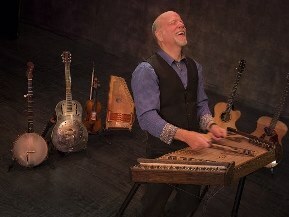 John McCutcheon will be bringing his slew of instruments, including guitar, autoharp, banjo, fiddle, hammered dulcimer, keyboards, and maybe a few others, to Beckman Institute Auditorium at Caltech Saturday, November 10 at 8:00 PM in Beckman Institute Auditorium (not to be confused with the larger Beckman Auditorium) at 8:00 PM. Along with his outstanding instrumental talents, John combines a rich, passionate voice, a deep familiarity of folk music tradition, a keen sense of humor, and dedication to social justice. Throw in a love of baseball and you’ve got an energetic performer who is wide-ranging and full of hope and full of anecdotes, too. He is the performer that we get the most requests for a return visit. Like his friend, the late Pete Seeger, John connects with people and the power of music. His brand new recording, To Everyone In All The World: A Celebration Of Pete Seeger has just been released and collects John’s favorite songs in anticipation of Pete’s 100th birthday next year on May 3. The Washington Post once described him as the “Rustic Renaissance Man” of folk music, and they were right. Come find out why! Tickets are $25 for adults and $5 for Caltech students and children. They can be purchased on the phone (626-395-4652) with a credit card (a service charge will be added per order), purchased at the Caltech Public Events Ticket Office in the Spalding Building (California Blvd. and Wilson Avenue) for face value (open Monday-Friday from 10:00 a.m. to 4:30 pm. ), or purchased at the door for cash or check (no credit cards.) Online tickets can be purchased here (service charge will be added per ticket). Occasionally, a show will be sold out before the day of the show, so call the Ticket Office, if you are planning to buy tickets at the door. Better yet, join our mailing list and you’ll be informed about such situations ahead of time.